Product #26690 | SKU 9520B002 | 0.0 (no ratings yet) Thanks for your rating! 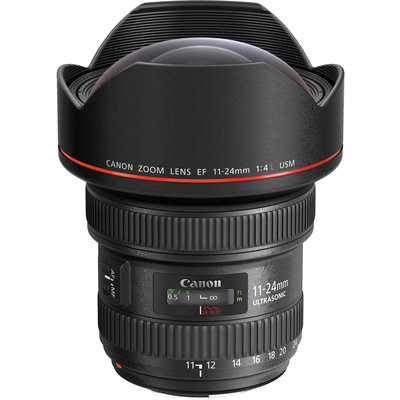 A truly versatile wide-angle zoom featuring an advanced optical design and constant f/4 maximum aperture, the Canon EF 11-24mm f/4L USM Lens is a member of the esteemed L-series of lenses designed for full-frame EOS DSLRs. One Super UD element and one UD element offer a significant reduction in chromatic aberrations while four aspherical elements help to minimise distortions throughout the zoom range and provide consistent edge-to-edge sharpness and illumination. Both SWC and ASC coatings have been applied to the elements in order to reduce lens flare and ghosting for increased contrast and colour accuracy. Ideally suited for landscape and architectural photography, this lens covers ultra-wide to wide-angle perspectives and backs up its versatile zoom range with sophisticated optical components and intuitive handling. In regard to focusing performance, a ring-type Ultrasonic Motor offers fast, smooth, and near-silent autofocus, which is further benefitted by full-time manual focus operation and an internal focusing design. The lens is both water and dust-resistant, and fluorine coatings have also been applied to the front and rear elements to protect against fingerprints and smudges from affecting image quality. One Super UD (Ultra Low Dispersion) and one UD element help to significantly reduce chromatic aberrations for improved clarity and colour accuracy. Four aspherical elements help to minimise distortions throughout the zoom range in order to maintain edge-to-edge sharpness and illumination. A ring-type Ultrasonic Motor (USM), along with an internal focusing system, high-speed CPU, and optimised AF algorithms, are employed to deliver fast, precise, and near-silent autofocus performance.